TheRustedChain - The Blog: Planning Pretty. I used to use a planner regularly but somehow fell out of the habit. So I thought if I had a pretty one, I'd be more likely to use it. My thoughts immediately went to duct tape. What? You don't think "pretty" and "duct tape" in the same sentence? You should. 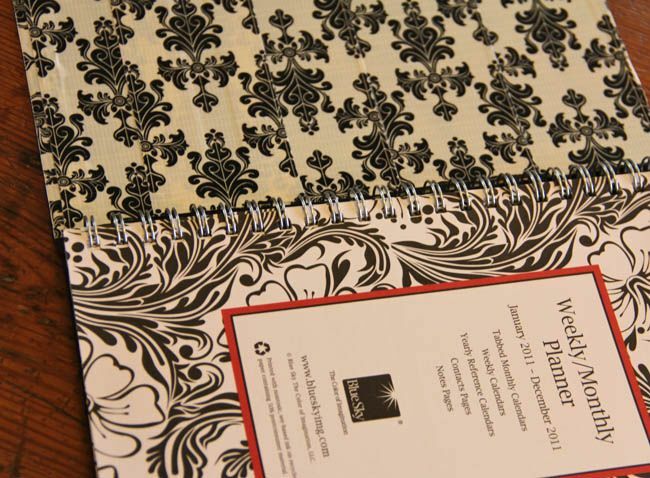 I'm loving their new patterns, including this black and white damask. I just did strips of duct tape down the front of the book. I could've lined up the pattern like you would with wall paper, but I'm a bit too lazy for that. I also covered the inside cover, just to make it feel more finished and secure. The coordinating black and white swirly pages were a bonus. So cute!! But it wasn't quite done. I hot glued a flower in my favorite shade of teal to the front. And then topped it with a Swarovski crystal. 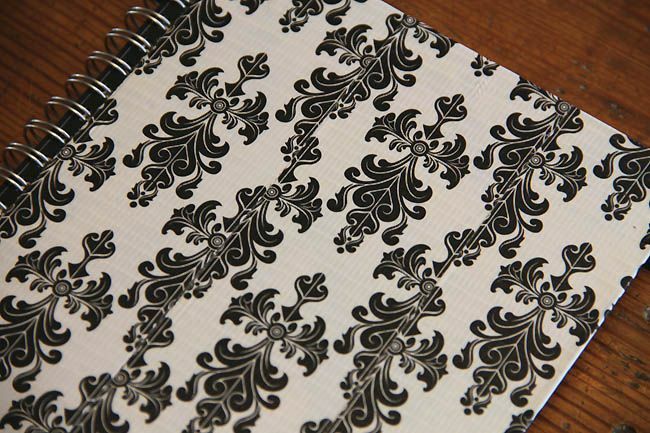 Black and white damask? Check. Pretty planner to keep me organized? Check. Have you used duct tape for anything pretty or fun? "I love pink!" Email us at TheRustedChainInfo AT yahoo please. I linked up at We Are That Family. ooohhh...pretty! I love damask patterns. I knew Duct Tape came in solid colors but not pretty patterns like that. I will have to look for some! We see that tape at Micheals all the time, I never know what to do with it. Cute project!! I love the mismatched look! You did an awesome job, you creative lady you!! Two thumbs up!! At least one Christmas present is wrapped in duct tape every year. One of Joe's friends made a really nice duct tape bow for Joe's present this year. It's one of the best inventions ever. wow, didn't know that duct tape comes in any color other than gray! thts awesome! Very creative and beautiful! I love it! I dont hink I would have ever thought of that. I had no idea duct tape came in patterns like that!!! love your idea; simple & clever! Cheap notebooks + about 10 rolls of fun duct tape + 45 Girl Scouts + 45 Sharpies = a fun journal for our campout! The girls got so creative they even made loops on each side of the notebooks to keep it closed and hold their Sharpies...hours of fun!!! I have a friend who took an old teeshirt, shaped it like a hobo purse and lined the inside and edges with leopard print duct tape. Cute! Somewhere along the line I have missed several of your posts. Where have I been??? Busy I guess. great! Friday's picture is stunning. Have not done anything with the printed duct tape but I might now. Love it. Stock up we are in for another biggie on Tues/Wed. I use zebra duct tape all the time in my art. I've pasted a link as an example. I'm addicted to duct tape and it's new patterns. Nice journal by the way. Love it! What a great use for cute tape and a plain planner...I like that this way you choose the planner that will work best for your organizing style or is the right price rather than the one that already comes equipped with a cute cover. that is super cute! would have never thought to use duct tape for a planner makeover! Ok... maybe this is a dumb question but I'm in Hong Kong and out of the loop of US things for about 6 years now. Where do you get this fancy duct tape? Walmart? I love the looks of it! super cute! love that tape!! LOVE the book idea. My 8yr old is into zebra. We show cattle, so we wrapped her showstick with zebra duct tape and put some bling on it! Now she has a one of kind stick in the show ring. Cute - and I love the duct tape - haven't seen anything like that before! 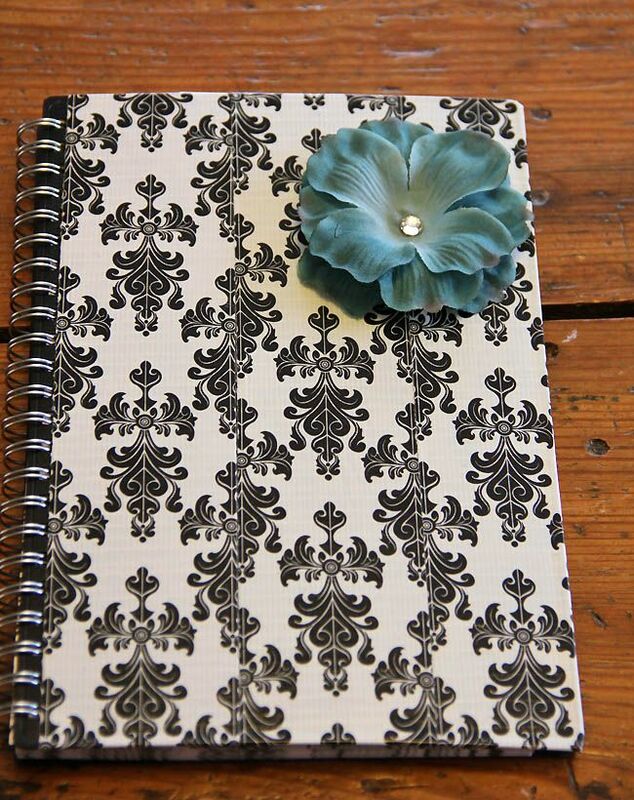 I LOVE black & white damask prints:) A cute and great way to keep you organized, too . . .
Wow! I have been oodling over that duck tape for months but not purchased it because I had no idea what I would do with it. Thanks for the awesome idea! I've never used the designer duct tape for projects... but, a friend's daughter made the cutest tote bag with 2 different patterns. She used solid for the bag part & the cute zebra print for the trim & strap/handle. Love this, Beki! 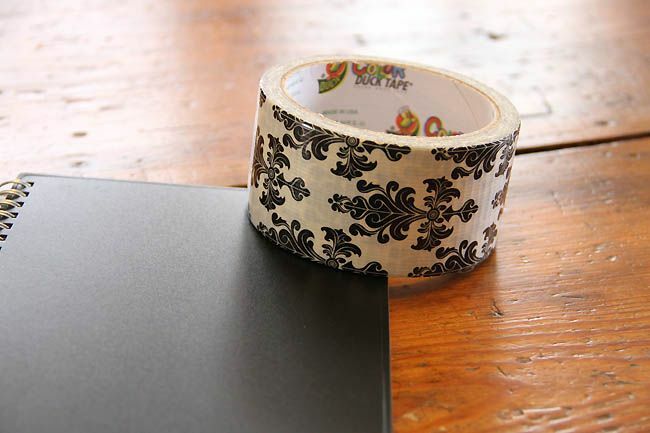 I had no idea they made damask duct tape...I'll have to track some down for myself! that turned out so stinkin cute! i am loving the patterned duct tape, but haven't used it yet..yet! Nice job on the planner. I have hot pink duct tape that I have used in my class at church for a couple of years now. We have dark blue carpet, and I make three big X spots next to the exit gate for the kids to sand on while they're waiting to "go potty". It helps us be organized since we have anywhere from 12-18 three year olds each week! Wow! I love that print. What a great tip! This would make a great gift also. 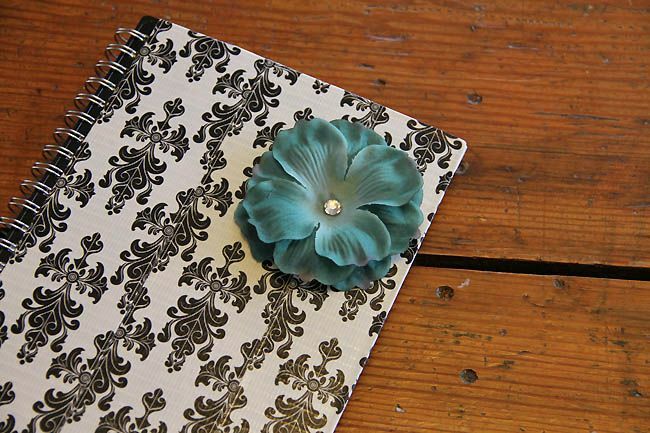 I LOVE the Damask duct tape, and your planner idea, but my Hobby Lobby in Conroe, Texas does not carry that print, can you tell me where I can find it or where you purchased yours at?